I love finding new fiberglass sports cars…. That is, information about new cars – cars that I have not heard of before built in fiberglass or forms of plastic where creativity shows no bounds. And that’s what happened when I stumbled upon a 2-sided brochure from the Bolide Motor Car Corporation advertising the Cycolac / plastic based car – the Cam Am 1 – on eBay earlier this month. 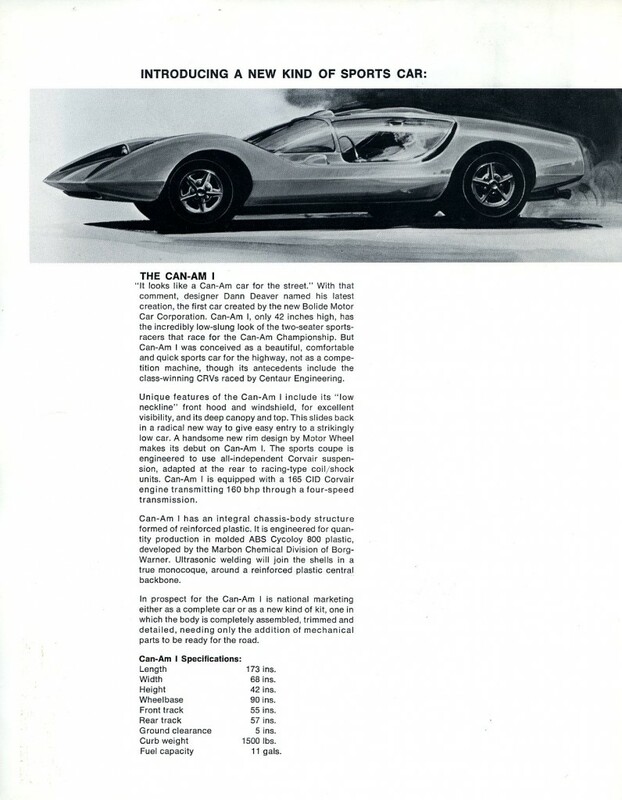 This car particularly interests me because it was done AFTER the CRV Research Vehicle – a car we now call the “Piranha.” And the Can Am 1 is associated with Borg-Warner which was the initial company that was responsible for making the CRV a reality. 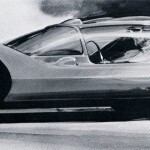 And when you dig into the history of this car, the Can Am 1, another magical name appears – Jack Griffith. Jack is best known for bringing to life the TVR Griffith which was a fiberglass bodied, American powered sports / race car from the mid 1960’s. 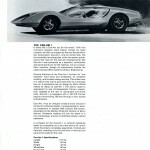 What an interesting history the Bolide Can Am 1 must have. But research on the internet revealed little if no history. My favorite kind of research project! 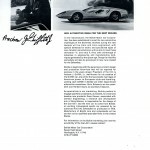 So let’s at least take a look at what the brochure I found had to say about this company and its first car. 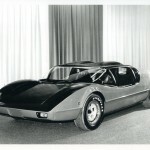 A new manufacturer, the Bolide Motor Car Corporation, has been established to meet the new automotive challenges of the Seventies. Markets during the next decade will be more and more segmented, with special demands for exotic and specialized types of cars. Bolide is beginning with the personnel, product design and production know-how that will be required for success in the years ahead. President of the firm is Andrew J. Griffith, Jr., well-known for his creation of the Griffith car, one of the first successful marriages of American power to European style and handling. 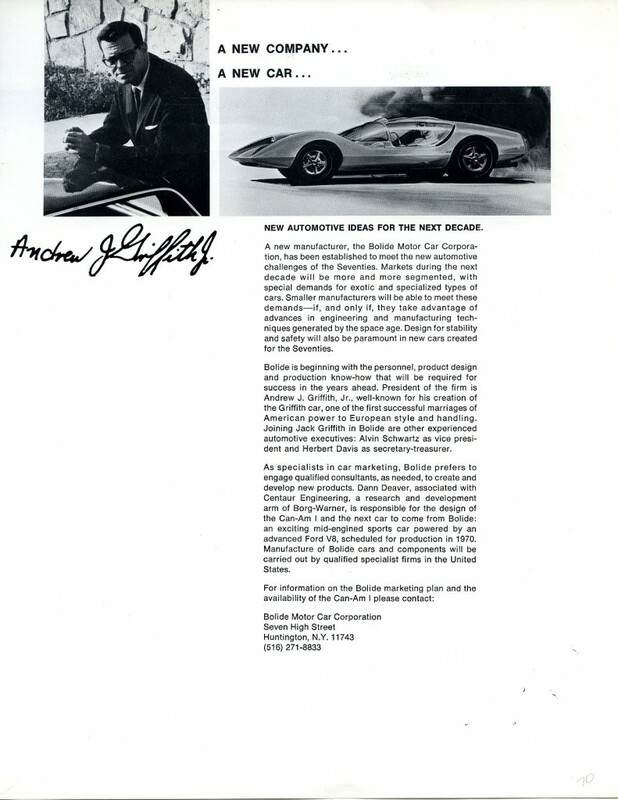 Joining Jack Griffith in Bolide are other experienced automotive executives: Alvin Schwartz as vice president and Herbert Davis as secretary-treasurer. As specialists in car marketing Bolide prefers to engage qualified consultants, as needed, to create and develop new products. 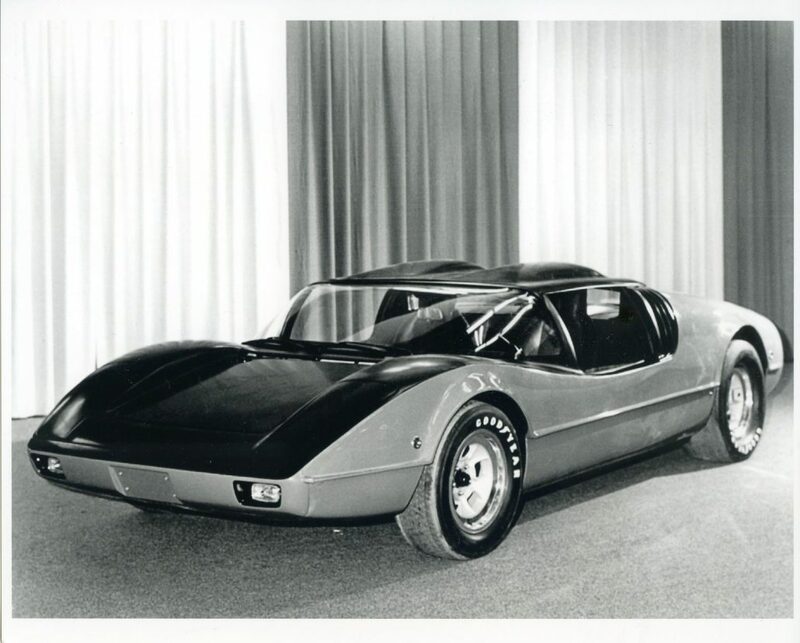 Dan Deaver, associated with Centaur Engineering, a research and development arm of Borg-Warner, is responsible for the design of the Can-Am 1 and the next car to come from Bolide: an exciting mid-engined sports car powered by an advanced Ford V8, scheduled for production in 1970. “It looks like a Can-Am car for the street.” With that comment, designer Dann Deaver named his latest creation, the first car created by the new Bolide Motor Car Corporation. Can-Am 1, only 42 inches high, has the incredibly low-slung look of the two-seater sports-racers that race for the Can-Am Championship. But Can-Am 1 was conceived as a beautiful, comfortable and quick sports car for the highway, not as a competition machine, though its antecedents including the class-winning CRVs raced by Centaur Engineering. Unique features of the Can-Am 1 include its “low neckline,” front hood and windshield, for excellent visibility, and its deep canopy and top. This slides back in a radical new way to give easy entry to a strikingly low car. A handsome new rim design by Motor Wheel makes its debut on the Can-Am 1. The sports coupe is engineered to use all-independent Corvair suspension, adapted at the rear to racing-type coil/shock units. Can-Am 1 is equipped with a 165 CID Corvair engine transmitting 160 bhp through a four-speed transmission. Can-Am 1 has an integral chassis-body structure formed of reinforced plastic. It is engineered for quantity production in molded ABS Cycoloy 800 plastic, developed by the Marbon Chemical Division of Borg-Warner. Ultrasonic welding will join the shells in a true monocoque, around a reinforced plastic central backbone. In prospect for the Can-Am 1 is a national marketing either as a complete car or as a new kind of kit, one I which the body is completely assembled, trimmed and detailed, needing only the addition of mechanical parts to be ready for the road. 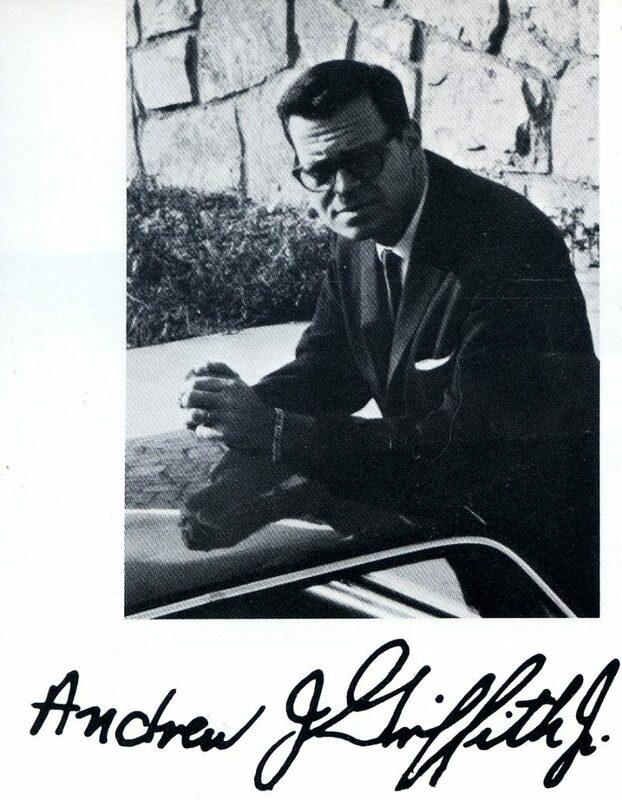 Thru mutual friends, I got ahold of Jack Griffith to see what more I could learn, but he remembered little from the project some 40 years ago. 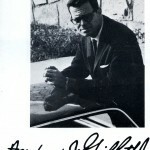 “The company lasted a short time and produced one car,” is what I learned from him. Jack is going to search a bit more and see what else he can find since no one has asked him about this car in such a long time. And what about the other car mentioned in the brochure? 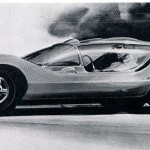 That is, “the next car to come from Bolide: an exciting mid-engined sports car powered by an advanced Ford V8, scheduled for production in 1970?” Jack indicated that the first car was the only car, but perhaps I was too specific. If they “named” the second car, he might remember a different history. 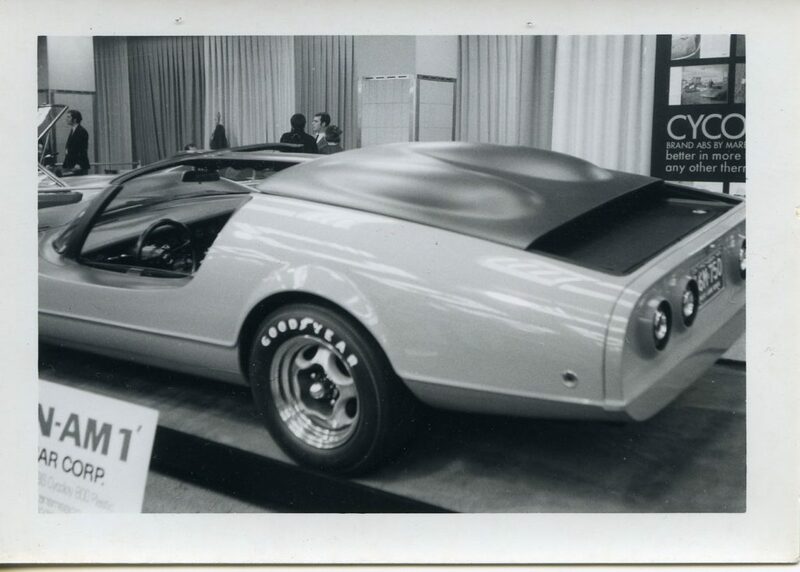 After all, Bolide did produce at least one more vehicle – but this was a concept for a Jeep – more about that later. And another mystery exists. If they made one car – where is it? The Can-Am 1 is a great looking sports car and deserves to be returned to the light of day. Where could this be and what condition might it be in? Inquiring minds want to know. Looks like the start of one of those fiberglass adventures to find the long lost Bolide Can Am 1 sports car. Anyone want to join in for the trip? It’s a neat machine, however, one has to wonder about the rearward vision when the ‘double-bubble’ cycolac roof section is slid to the rear. With the top section in place, over the passenger compartment, it appears that the rear window offers enough height for looking to the rear through the interior rear-view mirror. When the compartment is open, there is just a horizontal slot above the rear deck. Outside rear view mirrors or a camera with a screen on the dash would solve the problem. Maybe it already has that feature! We need to find the car. Nick Whitlow – our resident CRV historian may know more. Nick…can you help us out on what you may know of the history on this car? 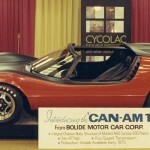 I was one oof the 3 Chrysler engineers that were the originators of CanAm 1., and chassis designer for the Bolide version. I am also one of the 6 originators of Centaur. 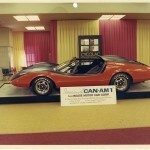 When Nick asked me to comment on the CanAm 1, I sent him the story of the car from my Projects Album in .pdf. He shortened it to fit your format. Should anyone be interested in the real story, I can email it as an attachment. Really great car, and yet another use of the Can Am name spawned by the immortal racing series of unlimited excess. I would hazard a guess that any plans for factory production of a full vehicle may have been scrapped with the demise of the Corvair. I know from doing research on the Fitch Phoenix that with the cancellation of the Corvair, John scrapped the entire venture after only building one car, which he retains to this day. Kit production would have been a great way to go, especially if they could have gotten the Ford V8 model onto the market. Very cool car that I look forward to learning more about. As great as that car looks,,I like the sketch of it better.Too much rear overhang for me.I’m pretty sure it could have ben less.I have seen V.W. kit cars with corvairs that didn’t have that much. What a shame there weren’t more of them built. Can Am was created around the concept of a driveline layout that accommodated a big engine in a midengine rear drive configuration without the need for a special design transaxle which had been conceived by three Chrysler engineers in the late 50’s. Borg Warner designed a custom drive reversing gearbox that would accomplish that. This drive layout was mentioned to Dan Deaver at Centaur Engineering around 1968 and he saw the potential for a radically different car. He began work on a design after hours and then invited several other Centaur employees to join him in the project. Deaver then contacted Jack Griffiths would be the Distributor and Marketing Director for the final project. They obviously made at least one prototype and did some promotional work. What happened after that will require further research. 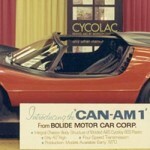 I worked at Centaur and helped bond the two body halves together on the Can-am. We only built one of them and it had a Ford V-8 mid=engine. The pictures in the story make me think that the vehicle pictured is the original built at Centaur. The story at the shop at that time was that it was built for Peter Revson the race car driver. Please get back to me if you can. Looking for some info for the upcoming 2nd edition of “The Griffith Years”. What would you like to know Mike? This is indeed a blast from the past. From 1963 to 1969, I worked for Borg-Warner Chemicals (previously Marbon Chemicals)and I was responsible for the development of wide sheet ABS thermoformed applications. I visited Centaur Engineering (which was part of Borg-Warner Chemicals) in Detroit and saw what they were developing from thermoformed ABS sheet. They already had a prototype refrigerator and also designed a complete house made from thermoformed ABS sheet. I remember also a six wheel all-terrain vehicle. The result of all this work was later to inspire Citroen to produce the Mehari, which I was also involved with. I’ve been giving the Can Am story a lot of thought and I think I have figured it out. 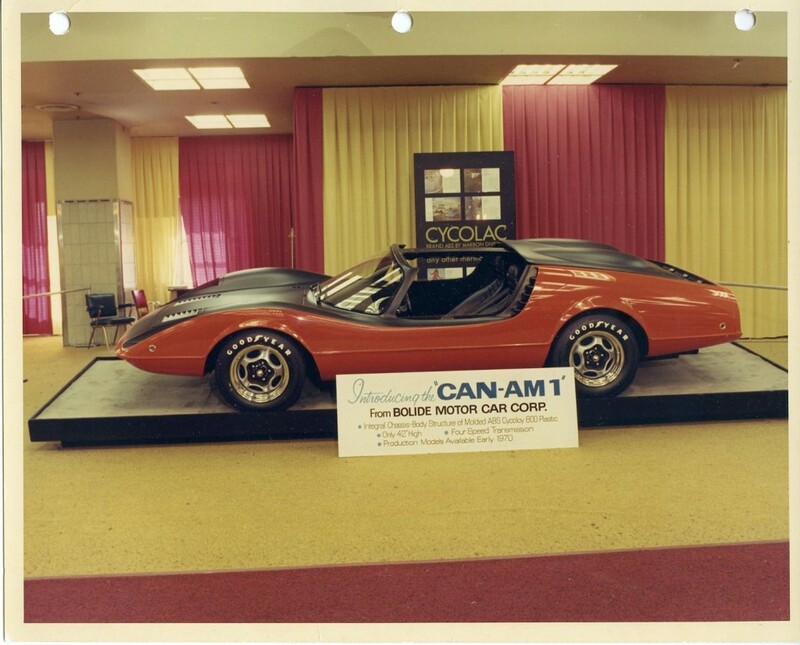 There were two CanAm’s produced it that era, The first (Can Am 1) was built at Quatro which was owned by Dan Deaver and several others. I believe it was actually fiberglass and was built with Corvair components. The vehicle I helped Bond together at Centaur was the Can Am 2 and it was ABS formed body and the inner and outer were bonded together with an ABS glue. The glue had a very short pot life so there were dozens of us spreading glue and the whole process took less than 5 minutes. 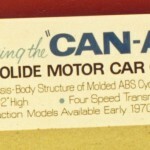 The Can Am 2 was a mid engine Ford V8 but had no roof. 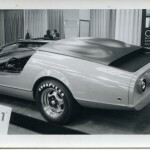 Another ABS bodied car we built at Centaur was the Formacar. I haven’t seen anything about it but I do have pictures of it if anyone is interested. I understand that the original Formacar was last owned by Barbra Strisand’s husband and was totally demolished. You are right. It is obvious that the second photo above is a different car. That is Can Am II which is Ford Powered. Can Am I, which in all the other photos and looks swoopier, was Corvair powered. I just recently saw a photo of both cars together. Ed, please contact me directly.